When the iPad was first announced I posted some brief thoughts about its potential for education. Since then, it’s been released and I’ve had the chance to spend some time playing with one. It’s been an opportunity to see to what extent the device itself and the software available would be a useful tool for supporting the work of teachers and lecturers. 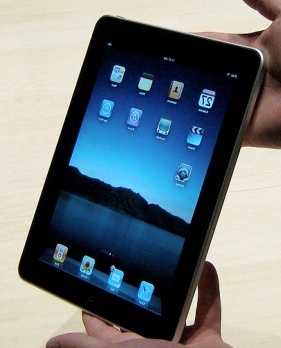 My initial impressions that the iPad functionally resembles a giant iPod Touch have been confirmed. Still, I use my iPod Touch all the time, so all the advantages of a bigger display are very attractive. The key question for me is to what extent the bigger display makes the iPad a great device not just for consuming media but also for generating content. The iPad is a great device to view content – it’s fast and the display quality is impressive. And of course there is a huge number of apps available for it, given that it’ll run existing iPhone / iPod Touch apps as well as apps developed just for the iPad. Want to edit online content such as Moodle or mediawiki pages? Results vary – you’ll almost certainly need to use HTML or wiki markup since the iPad is unlikely to work with wysiswyg editors. I don’t mind that – in fact I prefer to use HTML or wiki markup – but many teachers will find this a real drawback. And things are worse if you’re one of the many educators using the PBWorks wiki- at the time of writing it was impossible to edit a page with the iPad. You can’t print. So you’ll need to rely on a desktop or laptop computer for this. Using Google Docs? At the time of writing you can view but not edit using an iPad. Want to create media resources? There are useful apps becoming available, but the lack of native support for accessing the iPad file system and the use of proprietary file formats is likely to be a barrier. My two-year-old grandson loved using the built-in mike to make that cursed animated cat speak funny – but there is no obvious way just yet to record audio to standard file formats that can be moved easily to a desktop, edited in other applications and published. In my mind, Apple has focused too much on the entertainment aspect of its portable devices and neglected their use for real-world work. I’d like to see both, and I don’t believe they need to be mutually exclusive. The iPad is not quite ready to meet my needs as a working teacher – can’t wait to see the next version. This entry was posted in Tools and tagged content, create, edit, Google, ipad, media, moodle, online, resource, wiki on September 7, 2010 by Paul Left. Why do you say that, Jon? What does a laptop do that the iPad cannot? The announcement lacks specifics. But if the ability to edit covers all document types and is full-featured, that will make the iPad a lot more useful as a tool for teachers. Yes, I agree that an iPad is best seen as an accompaniment to a desktop or laptop. But for me, it doesn’t (yet) do enough on its own. I’d like to spend the day away from my desk and use it to update wiki pages or resources inside Moodle (say) without frustrating gaps in functionality. One of the great strengths of the Mac OS and its Linux roots is the high level of compatibility in media file types. The iOS has a more proprietary approach which detracts from this – while you can access and manage files, they are not necessarily in a compatible format. I want an ‘on the fly’ tool that will capture raw media in portable and compatible formats that I could then move to my desktop for editing and publishing. I am optimistic that the iPad will get there – but it doesn’t do what I want just yet. Many thanks for the detailed contribution, Kim! There’s some great discussion on this topic in response to Jeff Young’s article Diagnosing the Tablet Fever in Higher Education.